Description : It is a herbaceous perennial plant growing to 60 cm tall, with a thick succulent stem and evergreen glossy leaves. Flowering is in spring. The drooping cup-shaped flowers are yellowish-green, often with a purple edge to the five petal-like sepals on strongly upright stems. Foliage is pungent when crushed. All parts of the plant are poisonous, containing glycosides. Symptoms of intoxication include violent vomiting and delirium. Photo info : taken in mountain under a clear sky... Only resized and framed in 720x540 for TN and my website. Technique : FUJIFILM FinePix S6500 - Mode A - Auto focus - Aperture f3.8 - Shutter speed 1/800s - Iso 100 - White balance auto - Flash not fired - Focal 100mm equiv - File JPG fine - Handheld. Very sharp image in perfect exposure and focus in the shot! you made a good and interesting photo of this plant. I did not saw this plant in Romania as we have an other specie here. Very good image impresing by it's clear details of the flowers and the excelent way to render the texture of petals and fruits. May I think that all is OK at you as you resume sharing the pictures? I hope all is so. As usual you shot is amazing. The subject and composition are simply outstanding. I am also impressed with great sunlight, terrific DOF and superb sharpness of the plant and splendid smooth BG. Bravo, my dear friend. My hearty wishes and compliments. First I would like to say I hope everything on the home front has worked out OK? Again you've posted an excellent image..Very nice sunny look to this one. Perfect exposure, color, detail, DOF, POV, and composition..
beautiful hellbore very nicely capture, the OOF BG does show off this little beauty very well. Excellent capture, the details are nice and sharp and the colors are fabulous. It's great to see a photo from you, Christian. Great POV and superb composition. Sharp with lots of detail. Wonderful shot with very impressive sharpness and colours. Superb lighting and exposure levels and I like the shape and formation. Excellent DOF isolates the subjects from the BG ad a well chosen POV to portray it. Very nicely composed. Kudos. it has been a long time since I saw you, to long. I hope everything is well and your house is ready, that you can spend some time in the alps with your camera. Very nice picture with fine sharp details and nice DOF, the plant standout well from the BG. I'm sorry to have missed this beautiful Helleborine, different from any I've seen before. I love the colours and details are very sharp. A lovely soft background too in this fine composition. I've missed your presence here on TN and hope you'll soon be back more regularly. Oh my, it is not good to read about the car accident. I hope all is well with you my friend. As for the worries, I sincerely hope things (whatever they are) will work out for the better and that 2008 will turn out to be a good year for you and the family. You have worked so hard to beautify and extend your home and now that it is done I am sure you do not need other complexities to come and ruin it all so you cannot enjoy it because of worries. Take care my friend and I'll be thinking about you and carry you in my prayers. This is a wonderful little flower (even though it carries a deadly poisonous payload) and I cannot recall ever seeing it before. So, thanks for the introduction. What makes it outstanding is the fact that it has the same colour as its stem, with only the maroon edges on the petals, yet it is eye catching and beautiful. You have done excellent work to isolate if from the BG and to render it totally OOF, thereby enhancing the flowers and making it stand out well in the frame. Excellent colour rendition, amazing sharp details, and a wonderful composition with the large flower on the left and the smaller flower being held (delivered) into the right side of the photo. Very well done MF and TFS. Bonjour Taz my friend, I have been on holiday and didn't know you have posted this image. What a beautiful flower - I do like these helleborus roses. But we don't have these stinking ones out here. I would love to see them growing wild on your mountains. I do think of you often and especially at this awful time for you right now. I hope things all get better soon. 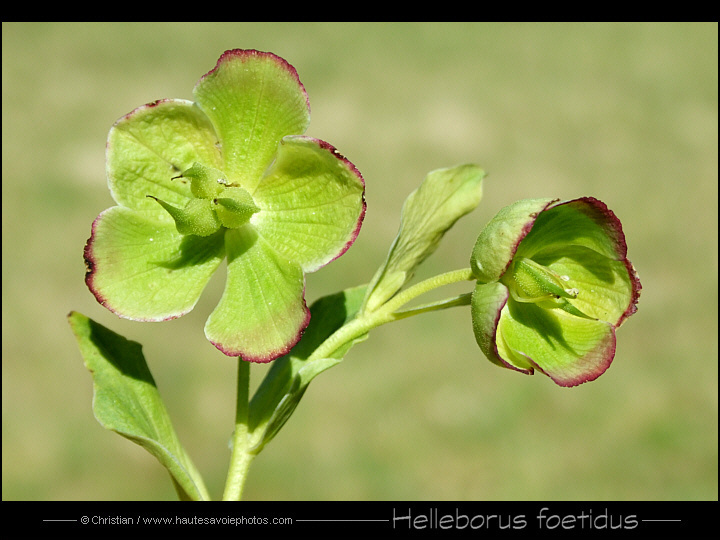 a pleasure to see your fresh work on Helleborus which is just beautifully simple and clear, and very precisely done. Very artistical composition with both blossoms perfectly placed and presented. Not even an artistic drawing could deliver a more perfect reduction to the essence. Reading of your recent troubles I send you all my best wishes to have your son back in good health, and to come over all the other malheurs. In different ways, this spring was a difficult time for many of us, and there are good times to come again very soon, for sure. Seeing nature the way you do is sending power and good energy. Thank you for sharing, all the best to you my friend. A beautiful shot. Wonderful clarity and detail against a perfect BG.